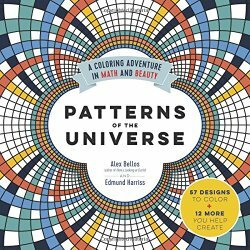 I was going to wait until I'd colored more patterns to review this book, but now I've decided that having read all the text, I can tell about how fascinating it is. Toward the end of 2015, I started hearing about the latest fad for adult coloring books. I saw this one based on math, and knew I wanted to try participating in the fad! I asked for it for Christmas, and two of my sisters sent me a copy. That turns out to be a good thing. I'm going to color one and copy pages out of the other. I think I will copy the pi-related coloring page to give as a prize for our scavenger hunt on Super Pi Day (3/14/16). 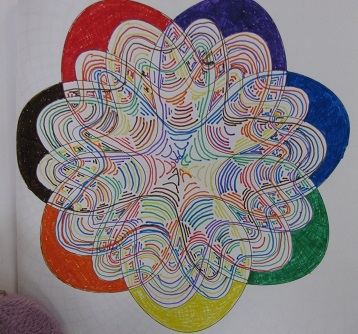 I'm also thinking about having a math coloring program at the library and using various pages, along with my own coloring sheets. The one pattern I have already finished coloring is the Sevenn -- a Venn diagram of seven sets. And coloring it made me glad I have another book from which I can make copies and try it again. The later, more interesting (to me) patterns come under the section heading "Creating," as opposed to simply "Coloring." When I looked at this section, it occurred to me that my mathematical knitting projects are an example of mathematical coloring -- with yarn! They did have a way of coloring prime numbers. Personally, I think my own way is more interesting, assigning primes a color and then coloring each multiple according to its prime factorization, whether in a grid as in my original sweater or the prime factorization blankets, or in a line in the prime factorization scarf or the prime factorization cardigan. However, the cool thing is there are quite a lot of new ideas that could be translated to knitting -- and this book got my brain spinning in new ways. It also made me realize that I could make my own coloring sheets. My knitting is coloring with yarn, and why not make these patterns available for people to try with their own colors? This book was the nudge that got me to pull out the diagrams and post them on my Sonderknitting page. I'm not an artist, so they are simply made with tables, but I think the prime factorization chart is especially helpful for learning about primes. And the prime factorization charts in other bases are helpful for understanding other bases. The Pascal's Triangle charts show you pretty patterns from Pascal's Triangle, and the normal distribution chart gives you a gut-level feeling for the normal distribution that's different from what you think when you see a bell-shaped curve. I'm looking forward to what new ideas will spark as I color the rest of the patterns in this book! And I'm also looking forward to seeing how pretty these patterns will turn out and what new insights I'll get. It's a win all the way around.